Remember when being up at 3am meant you were having a good night? No? Everything’s a bit foggy since you had a baby? After those crazy, hazy newborn days, most parents are longing for an uninterrupted night’s sleep (and likely, a regular shower). Take heart, the promised land may be closer than you think; you may be able to start night weaning. Is your baby ready for night weaning? 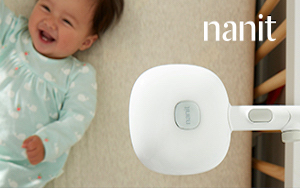 A cutting-edge baby monitor like Nanit can let you know if you’re visiting your baby at night more than you need to. But generally, when does that happen? Before you start night weaning, it’s important to have two things in place. First, you need to structure daytime feedings so that your baby is getting all the calories and nutrition they need during the day. If you eliminate nighttime feedings, you need to make up for it during the day, or your baby is going to wake up hungry. Dr. Barnett recommends milk feeding every 2.5-3 hours and 3 solid feedings a day, if your baby has started solids. Second, you want your baby to fall asleep independently at the beginning of the night. A baby who falls asleep on their own is more likely to settle themselves in the night without your intervention. They’ll find their own way back to sleep rather than looking to food or comfort. If you need some help getting your baby to fall asleep on their own, check out our post on raising an independent sleeper. Once you’ve laid the foundation, what’s the best way to wean your baby off night feeds? “There are a range of options depending on your baby and your parenting style” says Dr. Barnett. You can cut down on night feeds gradually, take a middle-of-the-road approach, or go cold turkey. If you choose to wean your baby gradually, Dr. Barnett suggests cutting down the amount of milk they’re getting at each night feeding over a period of a few weeks. Reduce the number of ounces your baby is taking for each night feed every few days until they’re no longer feeding at night. If you’re breastfeeding, nurse for shorter and shorter periods of time over a few weeks. Dr. Barnett suggests using 10 or 15 minutes as a starting point “by 4 or 5 months your baby should be able to get all the food they need in 10 or 15 minutes, so work down from there.” You’ll also want to be conscious of how your baby is sucking. As soon as they stop eating and start comfort sucking, unlatch and put them pack in the crib. If your style falls somewhere in the middle, give your baby a chance to get back to sleep on their own, but set a time limit on crying. If they haven’t settled themselves in that time period, go in, pat them on the back, rock them, or just feed them. Its up to you. Increase the amount of time you let them cry each night, for example, give them 20 minutes on night one, 30 minutes on night two, and 40 minutes on night three. Dr. Barnett recommends this approach for younger babies (closer to 4 months) rather than letting them cry indefinitely. If you’re a tear-off-the-bandaid type, make sure they are getting all the feeds they need during the day then eliminate the desired night feed, or all feeds, and let your baby cry until they settle themselves. If you take a gradual approach, it may take a few weeks. A middle-of the-road method can take a little less time, but will likely require a week or more. If you’re eliminating the feeds cold-turkey, it should take around 3 days. A good video monitor can also help allay your fears. You can easily check to see if your baby is wedged in the corner of their crib or if their foot’s stuck in the slats, so you know they’re not crying from discomfort. All this being said, the most important thing you can do is be consistent. “I cannot stress consistency enough,” says Dr. Barnett. “Weaning will take longer than it needs to if you don’t stick to your plan.” It also helps to be confident in your approach. Babies will feed off your mood, so when you’re sure of yourself, they are, too. Have confidence in your baby and yourself. Set them up for success, trust that they’ll find a way, and chances are, you’ll both get a better night’s sleep.